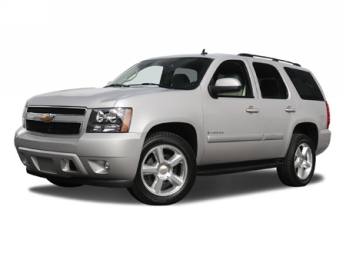 DETROIT – Expanding its range of capabilities, Chevrolet now offers a new, 6.2L small-block V-8 in the Tahoe LTZ in 2008. Rated at 380 horsepower (283 kW) and equipped with advanced technologies, it is the most powerful engine offered in the Tahoe lineup. The new engine is backed by a fuel-saving six-speed automatic transmission. The Tahoe LTZ 6.2L is available on 2WD models and bolsters a lineup that already includes a variety of powertrain options, capabilities and fuel solutions, including the all-new Tahoe Hybrid and models that are capable of running on E85 ethanol. Advanced technologies, including variable valve timing, and a lightweight aluminum cylinder block optimize the performance and efficiency of the 6.2L engine; and its 380 horsepower (283 kW) is complemented by a strong torque output of 417 lb.-ft. (565 Nm)*. A six-speed Hydra-Matic 6L80 RWD electronically controlled automatic transmission is paired with the 6.2L engine. It features a wide, 6.04:1 overall ratio – including two overdrive gears – that helps deliver an excellent balance of performance and fuel economy. Also, the 6L80 has a “tap up/tap down” capability that allows the driver to manually select upshifts and downshifts with a button on the column shifter. The Tahoe LTZ 6.2L has maximum towing capacity of 7,900 pounds (3,583 kg). Like all Tahoe models, the new, Tahoe LTZ with the 6.2L engine is built on a sturdy architecture that features a stiff, boxed frame, coil-over-shock front suspension, rack-and-pinion steering and a premium interior that bolsters the vehicle’s comfort, quality and capability. Wide front and rear tracks enhance handling and lower the center of gravity for a more confident road feel. Polished 20-inch wheels are standard on the LTZ and an available Chrome Appearance Package includes a stainless steel exhaust tip, chrome recovery hooks and the choice of one of six chrome 20-inch wheel designs. Tahoe is also designed with a 360-degree safety system of occupant protection and crash-avoidance technology, with features such as standard StabiliTrak stability control system with rollover mitigation technology. Head-curtain side impact air bags are standard.